Let’s talk cookies, shall we. Most people think that one of the perks of staying at a bed and breakfast is the cookies and goodies we make for our guests. I admit it is just one of the many perks. Our back yard has a giant pecan tree that has blessed us with a bumper crop of pecans this year. I hunted for a recipe to make cookies with and found this one on the internet. After making a few batches I finally have this recipe perfected enough to share with you. I hope you enjoy them and will make many batches for your family and friends. 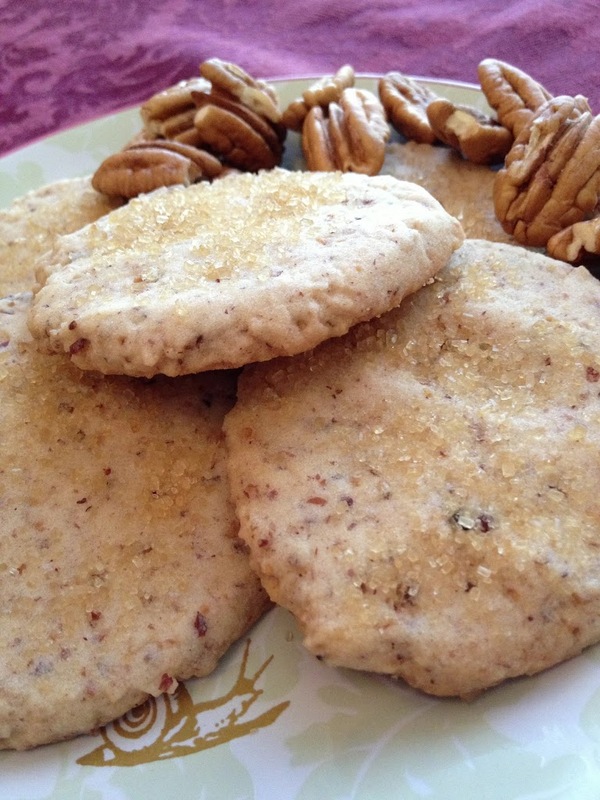 Pecan Sandie cookies from the White Oak Manor bed and breakfast. Spread the nuts out in one layer on a cookie sheet and bake them, stirring occasionally, until they are well browned, about 10 to 13 minutes (they will smell toasted and nutty). Transfer the pan to a wire rack to cool. Using an electric mixer, beat the butter and sugar until creamy and smooth, about 2 minutes. Add the vanilla and beat well. Sift together the remaining 1 3/4 cups flour, the salt, and the baking powder, and add it to the dough, mixing until just combined. Stir in the nut mixture. Use an ice cream scoop or a tablespoon, place cookies on baking sheet, lightly press down with fingers to about 1/8” thick. Sprinkle with the raw sugar and bake approximately 18 minutes. Ovens vary so check after 10 minutes. The cookies are done when lightly browned on the bottom. OR if you prefer form the dough into a disk, wrap in plastic wrap, and chill for at least 3 hours. roll the dough in between two sheets of waxed paper to 3/16″ thick. Using a sharp knife, cut the dough into 1-inch squares, then cut the squares on a diagonal into triangles. Sprinkle the cookies with the turbinado sugar. Place them 1-inch apart on ungreased cookie sheets (do not re-roll the scraps). Prick the cookies with a fork and bake until pale gold all over, about 10 minutes. Cool on a wire rack. This entry was posted in Recipes by Tammy D. Bookmark the permalink.